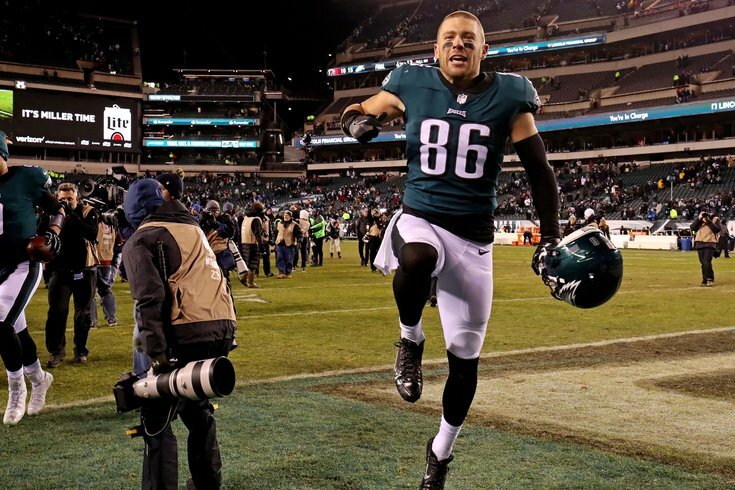 Philadelphia Eagles tight end Zach Ertz celebrates after beating the Atlanta Falcons in the NFC Divisional playoff game at Lincoln Financial Field. For years, the idea of the Eagles being the "Gold Standard" of the NFL has been used to mock owner Jeffery Lurie. A lot of that scorn was deserved — how could a team with no titles since 1960 make claim to such a title? They look a lot closer to that ideal these days. Philadelphia has a second-year coach hitting all the right notes, a second-year QB who played like an MVP, and a good chunk of their core locked up for years to come. The Eagles are firing on all cylinders, and it looks like their success should be sustainable. Tight end Zach Ertz certainly believes so. Wentz's favorite target was asked about the emotions he has seen from his buddy while watching the team take flight without him, and Ertz stressed to reporters that all the guys watching from the sideline have been cheering on their teammates with gusto. I think everybody wants to be playing in the Super Bowl. Not only Carson [Wentz], but [Jordan] Hicks, JP [Jason Peters, [Darren] Sproles – all these guys want to be playing in the Super Bowl. But all those guys have been extremely supportive of everyone in this building. They were just as excited last game as they would've been if they were playing in the game. That selflessness is not easy to come by, it's not easy to find. You see a lot of guys, when they get hurt, they check out. That couldn't be further from the truth for each and every one of those guys. That's not an easy thing to do for players who don't know whether their shot to play in the Super Bowl will ever come. It speaks to the culture cultivated by Doug Pederson and his staff, but it's also a reflection of the collective character of the team. Philadelphia's locker room is filled with leaders; even with that quartet of names sidelined, you have guys like Malcolm Jenkins, Chris Long and Lane Johnson setting examples on and off the field. Maybe that's why Ertz doesn't think Wentz should worry too much about missing this big game. As Ertz would go on to say, this team believes they have the talent and youth to get back here in the years to come, and a spot in the Super Bowl should be demanded moving forward. Obviously, Carson's going to be playing in these situations hopefully for a long time. The expectation here in this organization is that this isn't going to be a one-time thing in the future. That's kind of the organizational standard now, I think, is being in this game over and over. That's what we expect as a team, and I think that's why they have the players here to kind of have that sustained success. All the ingredients are there to make that a reality. Almost every single one of the team's core players is locked up beyond this season. Extensions have already been handed down to offseason pickups Timmy Jernigan and Alshon Jeffery, and key figures like Ertz, Jenkins and Fletcher Cox are locked in through at least 2020. Wentz's current contract makes all this a lot easier — when you're getting elite quarterback play on a rookie salary, it allows you to overspend to solidify other parts of your football team. Beyond the cap sheet, the Eagles have consistently ranked among the best NFL franchises to play for. A deep postseason run led by a coach who continues to gain respect will only help that reputation, and there is real reason to believe this could be the start of something special. Of course, many thought it would be a stretch for the Eagles to win the NFC East this season, let alone get to the Super Bowl. Things can change fast in the NFL, and nobody knows that better than the fanbase who watched Chip Kelly's fall from grace unfold up close. But regardless of what happens from here, Ertz's mindset is one that should be echoed up and down the organization. Eagles fans will demand success following this dream season, and they will be well within their right to do so.